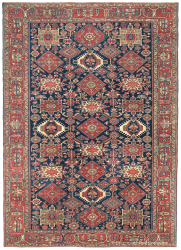 Village rugs refer to a category of antique Persian carpet that were woven on an informal, local level as a cottage industry for use either by regional communities or for sale to a wider market. 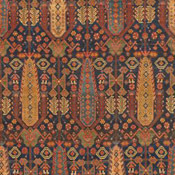 Created using traditional weaving practices by multiple weavers working on scaffolding at home-made vertical looms, the best village carpets exhibit much of the artistic creativity, spontaneity and asymmetry common to tribal carpets, where the weavers’ relative autonomy permitted a wider range of expression. 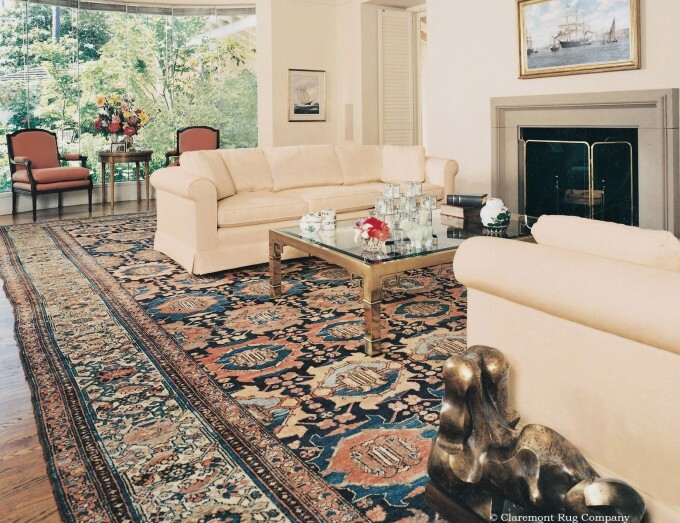 As a result, many connoisseurs believe village rugs to be the most artful of all room-size to palace-size Persian carpets. 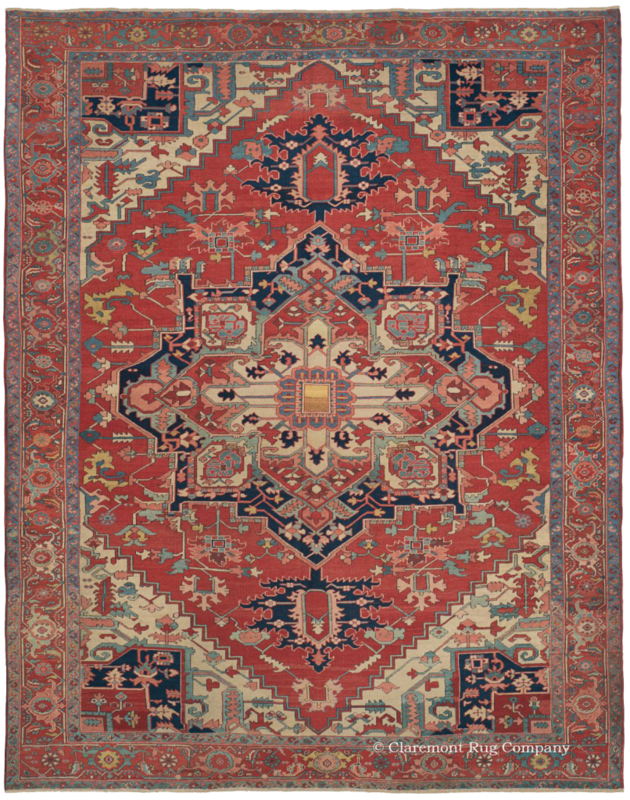 Persian village carpets from the 19th century and the beginning of the 20th century are known to display a wide spectrum of vibrant, uncommonly harmonious colors, the result of traditional dyeing practices using natural materials. Due to their proximity to local sources, carpets in the village tradition frequently often incorporate high-quality wool, sometimes sourced from the weaver’s own flock or purchased from nomads in the surrounding area. 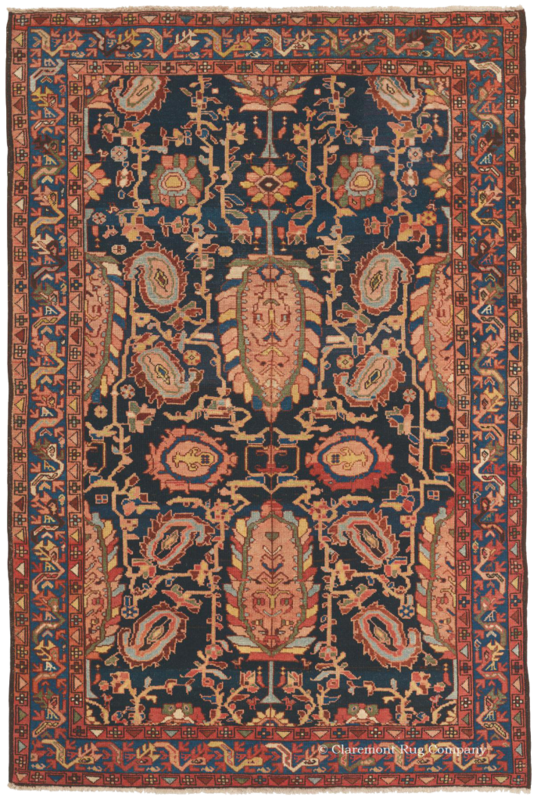 During the 19th century, the growing market for Persian carpets led to a gradually increased exposure of village rug producers to the practices and designs of workshop and city carpet categories. Motifs and compositional elements were creatively adapted from these traditions. In many cases, the advent of the commercial weaving period in the early 20th century resulted in drastically reduced creativity and quality. By the 1920’s, distanced from their traditional weaving heritage, the majority of weavers began to conform to standardized formats suitable for mass production. Heriz rugs present a striking hybrid of styles, combining the scale and grandeur of a city carpet with the charm and rustic appeal of traditional tribal rugs. Heriz carpets are thought to be the result of merchants from Tabriz approaching groups in the surrounding area with an existing tradition of weaving to produce room-size carpets for export. 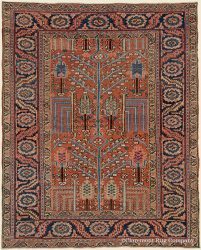 The hallmarks of a Heriz rug is the warm-toned color palette done entirely in natural dyes, a large central medallion, and oversized corner-pieces. 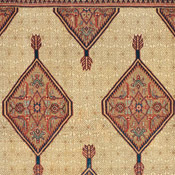 Heriz rugs are typically found in room sizes and larger, and have geometrically inspired designs. 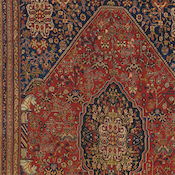 To browse a selection of exquisite antique Heriz carpets in the gallery, click here. Serapis represent some of the best-known and widely recognized Persian carpet styles, as they were the carpet of choice in many early federal buildings. Serapi carpets showcase a style that draws inspiration from both Caucasian geometric patterning and grand scale court carpets, featuring a central medallion with open reserves and bold colors. The Serapi palette is quite vibrant, showcasing the exceptional skill set of the local women when it comes to natural dyes. The bold red tones have their origins in the madder root, while the rich variety of blues come from the indigo plant. Serapi carpets are typically found in room size dimensions, though smaller and larger carpets can occasionally be found, much to the delight of rug connoisseurs. 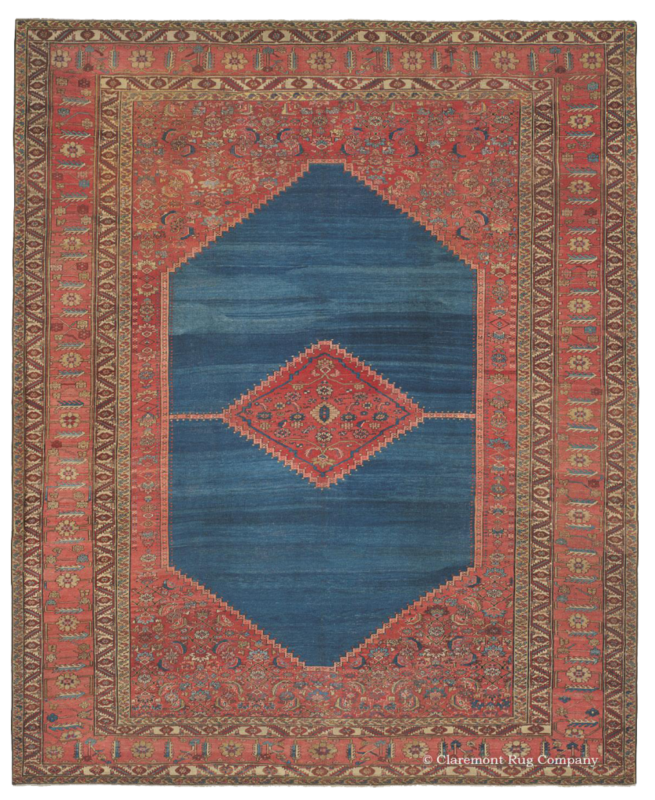 To view a selection of antique Serapi rugs in the gallery, click here. 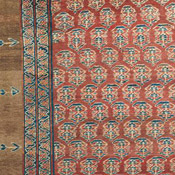 Malayer refers to rugs woven in the weaving center of Malayer and the surrounding villages. 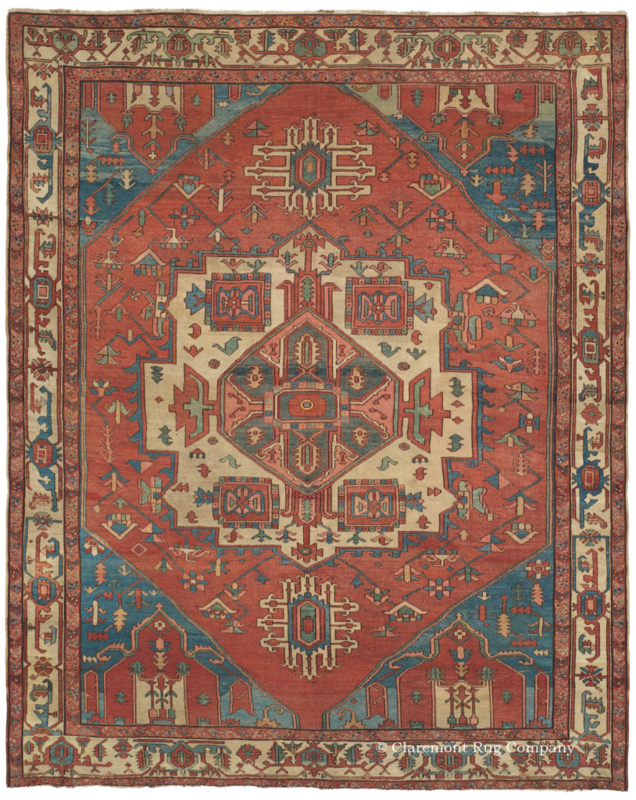 Rugs produced here are beloved as some of the most decorative village weavings, with boteh, flower heads, scrolling vines, and stylized birds being popular designs. 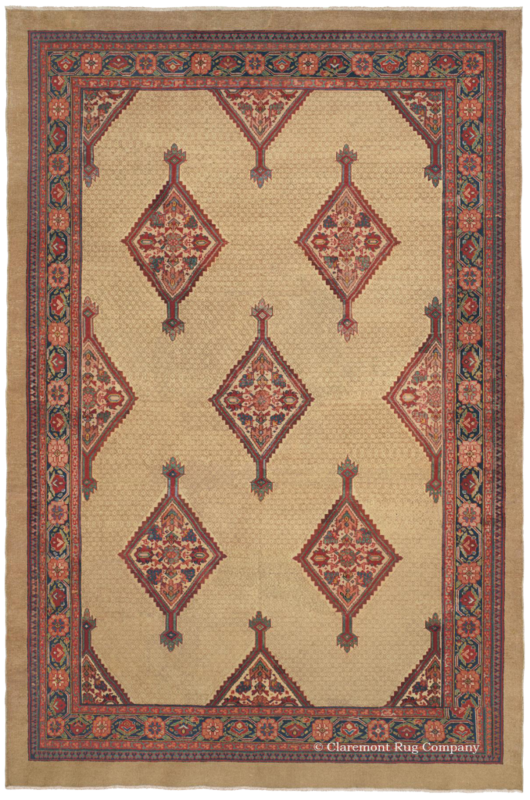 Malayer weavers incorporated these patterns into both the all-over designs preferred by westerners and the traditional medallion style carpets. Malayer rugs frequently employ bold blue tones as a ground color, accentuated with a rich variety of naturally dyed hues. Occasionally one can find a Malayer rug that uses natural undyed Camelhair as a ground tone, and these are among the pieces most coveted by collectors. 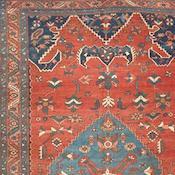 The best-of-the best Malayer rugs come from the village of Mishin and are known as “Mishin Malayer”. 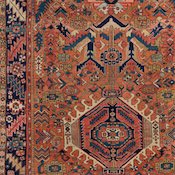 To see more of these extraordinary antique Malayer rugs in the gallery, click here. Serab The village of Sarab was known for producing distinctive runners and corridor carpets. Very few small size rugs and rugs 9×12 and larger were woven there, thus, are extremely difficult to find in today’s market. 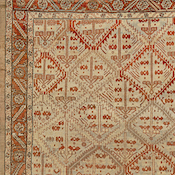 The traditional Sarab pattern language features heavily geometric designs with multiple diamond-shaped medallions on delicately rendered latticework fields. Serab was the one area in Persia that primarily wove rugs using large amounts of undyed camelhair of varying shades. Serab pieces tend to be finely woven and use the Ghiordes (Turkish) knot. The finest 19th century Sarab rugs and runners are in high demand by art connoisseurs as their angular designs and earth tone color palettes provide the perfect foundation to contemporary artworks displayed on the walls. To browse a selection of exquisite antique Serab carpets in the gallery, click here. 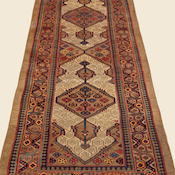 Karaja carpets represent a stylistic blend between village and tribal rug traditions. Karaja are recognized principally by their distinctive pattern, a latchhook diamond flanked by two architectural medallions along a central vertical axis. Their patterning is always very geometric, and can be highly similar to the imagery of antique Heriz rugs, woven approximately 45 miles distant. Saturated red and indigo colors are typical.  Runners and area size carpets predominate, with room size rugs woven only very rarely. To view a selection of antique Karaja rugs in the gallery, click here.